MassMedieval is proud to present a second surprise! Jonathan Hsy was a panelist on the same Babel punctuation session at ICMS 2014 referenced in my previous post and in the guest post by Josh Eyler. After reading these posts (and publicizing them widely), Jonathan has also offered us the full text of his presentation on the ampersand (&). We are very grateful for this continued generosity, and we hope our readers are enjoying this series of posts as much as we are. Jonathan Hsy is Associate Professor of English at George Washington University, and his research and teaching interests span the fields of translation studies and disability theory. His first book, Trading Tongues: Merchants, Multilingualism, and Medieval Literature (Ohio State University Press, 2013) investigates the work of polyglot urban writers across the late medieval and early Tudor eras. His current book project, Disability and Life Writing: Authorship as Advocacy, Then and Now, explores writing by medieval authors who self-identify as blind or deaf. Hsy is also the founding Co-Director (with Alexa Huang) of the GW Digital Humanities Institute, and he is currently involved in a few collaborative digital endeavors. He blogs at In The Middle, serves on the Editorial Committee of the Online Medieval Disability Glossary, and is collaborating with Candace Barrington on Global Chaucers, an emergent online archive of modern adaptations of Chaucer in non-Anglophone settings. In modern English, the symbol & [ampersand] stands out among punctuation marks due to its status not as a silent break between words but rather a glyph that signifies an entire word in itself. That is to say, the ampersand functions not as a punctuation mark but rather as a logogram, compressing an entire word (semantic unit) into one graphic symbol. The ampersand, moreover, really came into its own in Middle Ages as a ligature: most visible, for instance, in the linking of Carolingian letters E and T (the Latin word “et”). I really love the ampersand because it’s so cute. So beautiful. So aesthetically pleasing. So logographically distinctive. The aptly-named blog 300&65 Ampersands devoted an entire year (2010 to be precise) to celebrating the ampersand in all its variety. Each day readers were reminded that the ampersand marks a distinctive flourish for graphic designers and typographers alike. I also love the ampersand for its conspicuous capacity to signify “and”-ness across languages. The symbol has unique conjunctive powers, and the ampersand does not so much conjoin thoughts as squish them together, enacting a confluence of languages. The name “ampersand,” of course, derives from a bilingual utterance that schoolchildren would recite back in the days when the symbol was considered a “letter” of the alphabet like A and I. In this 19th-century hornbook, the ampersand appears at the end of the alphabet after all the capital letters. When reciting the alphabet (so the story goes), schoolchildren would make the utterance “A per se A” [A by itself means “A”], “I per se I” [I by itself means “I”], and “and per se and” to drive home the point that the symbol “by itself” signaled an entire word. “And per se and” becomes “Ampersand.” Its very name in modern English squishes together two languages (English and Latin) into a conjunctive neologism. At this point I’d like to pivot to consider the post-medieval life of the ampersand when it enters into print culture and show some of the ways it brazenly flaunts its capacity to move across tongues. Shakespeare’s Henry V is one of my favorite fictive explorations of medieval language contact. In the final courtship scene (Act 5, scene 2), English Henry woos French Katherine initially through her interpreter Alice but soon both attempt to speak, however haltingly, in the other’s language. 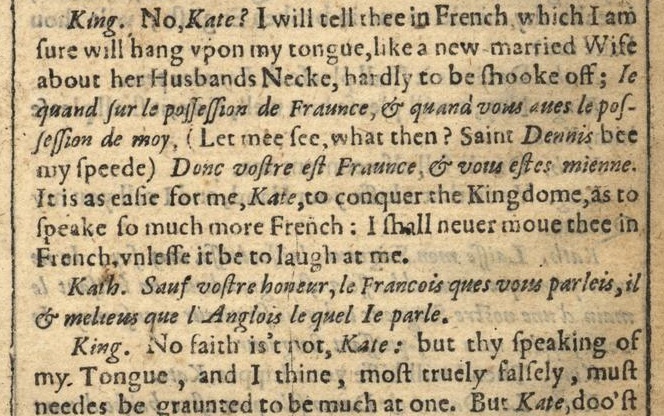 In this excerpt from a printing of Henry V in Shakespeare’s First Folio(1623), the French dialogue (code-switching) is signaled by italics. First, Henry speaks to Katherine in his halting French: “Ie quand sur le possession de Fraunce, & quand vous aues le possession de moy … Donc vostre est Fraunce, & vous estes mienne” [When I have the possession of France, and (&) when you have the possession of me, then France is yours, and (&) you are mine]. Throughout Henry’s utterance, the ampersand marks the French conjunction “et” [and], conjoining a chain of thoughts on language and reciprocal possession. Katherine then praises Henry’s French: “le Francois ques vous parleis, il & melius que l’Anglois le quel Ie parle” [the French that you speak, it is (& = est) better than the English that I speak]. 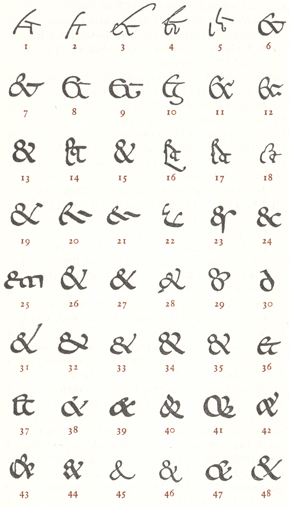 Here, the ampersand shifts, standing in now for the French verb “est” [is] rather than the conjunction “et” [and]. In a case of typographical irony, the early modern compositor has improperly repurposed the multivalent logogram. Fittingly, this typographical toggling happens in the very episode in the play where boundaries between French and English vernaculars and their overlapping claims to “possession” are increasingly blurred. And now for a coda, addition, appendix, appendage: some brief comments on the ampersand’s sibling, the Tironian “et” (i.e., the numeral-seven-shaped symbol or plus-sign glyph that also signifies the word “and”). In one sense this Tironian symbol has a parallel life to the ampersand. On the QWERTY keyboard the ampersand (&) lives on the same key as seven (7), suggesting a typographical coupling or toggling between the two. And these symbols’ parallel lives nicely register across languages. 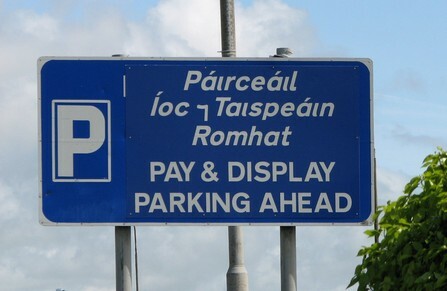 This sign for a “pay and park” in Ireland uses the Tironian 7 in the Irish text but the & (ampersand) in English text below. Despite their similarity in meaning, the Tironian symbol and the ampersand are not entirely interchangeable. The Tironian “and” diverges from the ampersand in another important respect: it can serve a slightly different grammatical role in Latin. The mark in Latin texts did not merely signify a conjunction but could stand in for the enclitic suffix “-que” (meaning “and”). So the next time you see the ampersand (or its sibling, the Tironian “and”), don’t just admire the symbol because it’s cute or aesthetically pleasing. Respect it as a logogram. Marvel at its power to move across languages. And consider how it encourages us to adopt not so much “conjunctive” thinking as a concurrent processing of languages and meanings. Image 1 is excerpted from the section on the ampersand from Keith Houston’s informative book on punctuation marks, Shady Characters (2013); the blog that spawned Houston’s book is also excellent. Image 2 is a screenshot from this digital reproduction of the Brandeis University Library copy of the First Folio, via Internet Shakespeare Editions. For the history of this symbol, see Keith Houston’s excellent blog posting. Image 3 can be accessed on this entry on Stan Carey’s language blog, along with related links about the ampersand. See Adriano Cappelli (trans. David Heimann and Richard Kay), The elements of abbreviation in medieval Latin paleography (Lawrence: University of Kansas Libraries, 1982), section 3.72 [p. 18]. 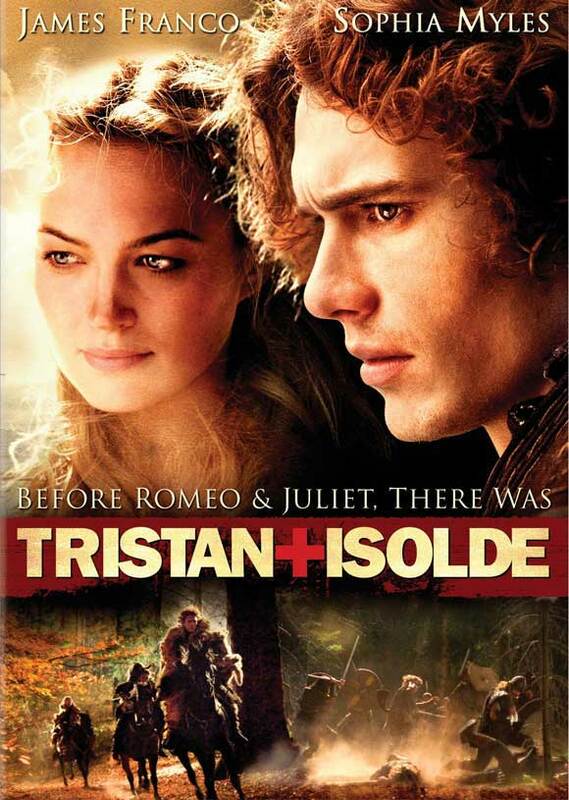 Image 4 was accessed through Craig Koban’s online review of Tristan and Isolde (2006).